NETWORK FINALS: The LITTLE BIG SHOTS rerun gained 0.1 in final numbers. CABLE HIGHLIGHTS: As was the case last year, the newly-rebranded MTV MOVIE & TV AWARDS aired across the Viacom suite of networks. On MTV itself, the show was down 0.17 from last year’s edition to 0.61. Here were the rest of the results. 0.13 on Spike, 0.12 on both VH1 and BET, 0.11 on Comedy Central, 0.09 on TV Land, 0.06/143K on MTV2, and 0.01/16K on MTV Classic. (This year the show didn’t air on Logo.) On MTV, the awards were preceded by a TEEN MOM special at 0.43, and the lead-in to that was a special LIP SYNC BATTLE at 0.33. On Showtime, the BILLIONS season finale gained 0.02 to 0.26 (but down 0.06 from the 2016 finale), although it should be noted that it couldn’t have had a worse lead-in than the pathetic GUERRILLA, which managed to lose 0.01, down to 0.01/85K. On HBO, SILICON VALLEY ticked up to 0.40, LAST WEEK TONIGHT returned from a week off at 0.40, THE LEFTOVERS dropped 0.07 to 0.29, and VEEP was down 0.04 to 0.18. Starz’s AMERICAN GODS fell 0.06 from last week’s premiere to 0.30, and THE WHITE PRINCESS ticked up to 0.21. The season finale of E!’s THE ARRANGEMENT dropped 0.05 to 0.26. The night’s leading scripted series was Adult Swim’s YOUR PRETTY FACE, down 0.05 to 0.54. AMC’s INTO THE BADLANDS lost a tick to 0.50. Hallmark’s THE GOOD WITCH rose 0.04 to 0.24. Lifetime’s MARY KILLS PEOPLE gained 0.03 to 0.17. TNT owned the night’s NBA PLAYOFFS games, which gave them the win at 1.91/1.76, led by San Antonio vs. Boston. After the late game, TNT ran a “preview” of its series AMERICAN RACE at 0.48. On Bravo, REAL HOUSEWIVES OF ATLANTA jumped 0.21 to 1.34, and REAL HOUSEWIVES OF THE POTOMAC was up 0.06 to 0.75. Discovery aired 2 hours of NAKED & AFRAID at 0.75/0.65, compared to last week’s 0.73/0.68. 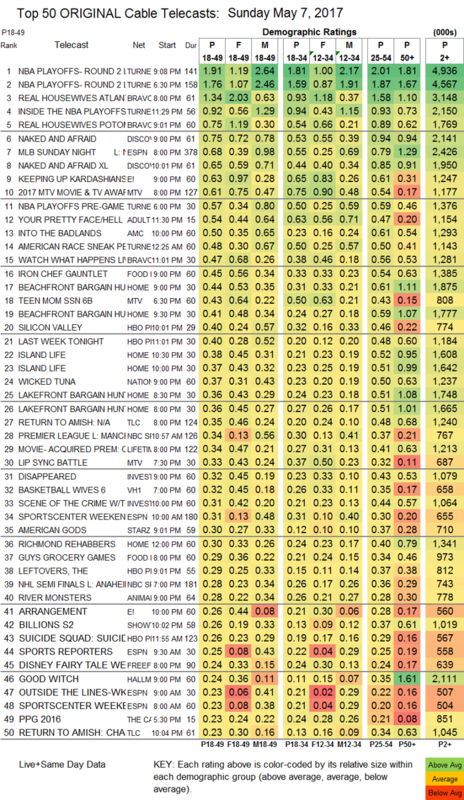 E!’s KEEPING UP WITH THE KARDASHIANS was steady at 0.63. On Food Network, IRON CHEF GAUNTLET lost 0.04 to 0.45, and GUY’S GROCERY GAMES was down 0.03 to 0.29, with IRON CHEF EATS at 0.20/0.17 compared to last week’s 0.27. 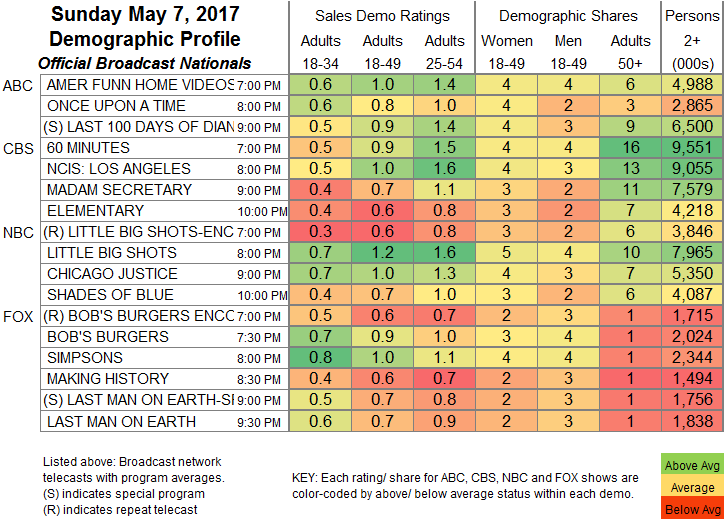 TLC’s RETURN TO AMISH rose 0.02 to 0.35, while the AFTER-SHOW was down 0.06 to 0.23. On ID, DISAPPEARED climbed 0.03 to 0.32, and SCENE OF THE CRIME was up 0.05 to 0.31. VH1 aired a special BASKETBALL WIVES at 0.32. AMC’s TALKING WITH CHRIS HARDWICK fell 0.02 to 0.11.